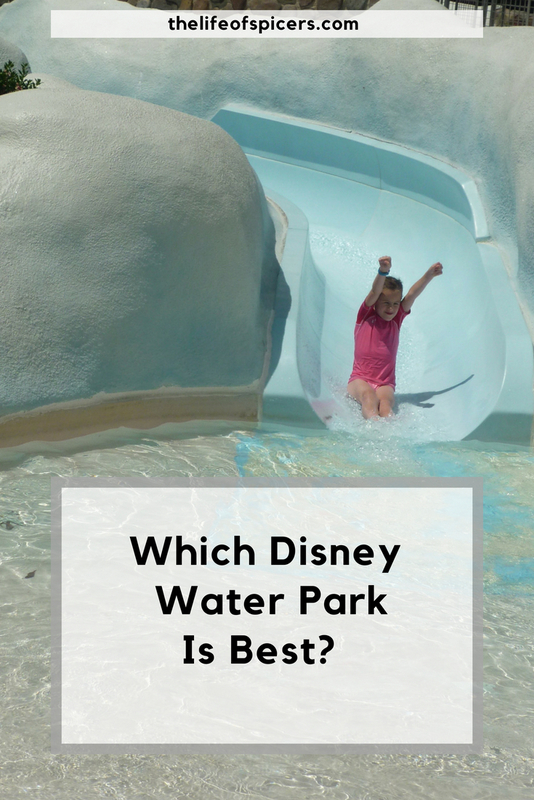 During our trip to Walt Disney World last Summer, we visited both Disney water parks, but which water park is better at Disney World? 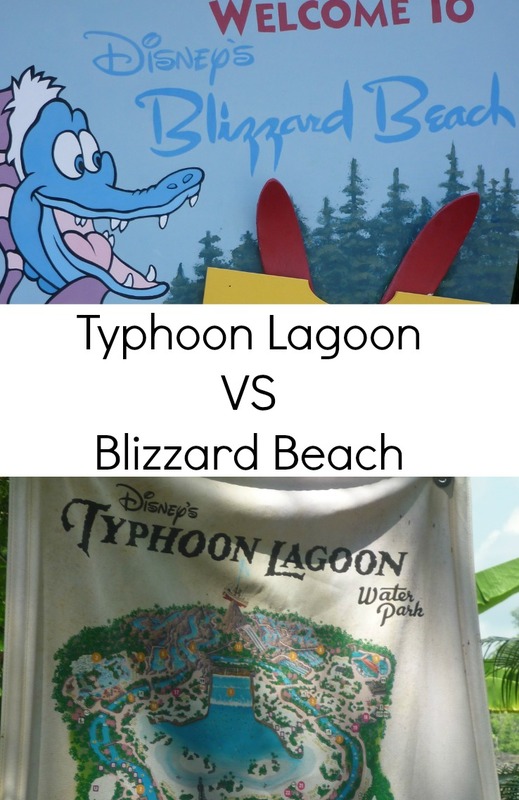 This post will look at Typhoon Lagoon VS Blizzard Beach. Attractions at Disney World Blizzard Beach include 11 water attractions and a ski lift to take you to the top of the mountain where three of the rides start from. There are alternative steps if you don’t want to take the ski lift to the top of the mountain but be prepared to be breathless on a hot day. We took the stairs as the weather was a little cloudy and the ski lift wasn’t operating but it was hard going. The park is based on a freak snowstorm said to happen in Florida which led to the first ski slopes. As the snow didn’t last very long in the Florida heat, it left flooded areas of snowless mountains. What a perfect way to transform into a water park! For a gentle and relaxing view of Blizzard Beach you can enter the Blizzard Beach lazy river (Cross Country Creek) that circles the whole park and float around on a large inflatable ring. What I loved about Blizzard Beach was that there was plenty of seating close to the entrances to the lazy river. We walked past the front of the park and the crowded sandy areas that were covered with seats towards the middle of the park and found some seating near an entrance to the lazy river. This gave us a good spot to remember where we left our towels, and also meant we could get in and out of the lazy river at the nearest point to the rides we wanted to try instead of walking all around the park to the rides. The water in the lazy river is very refreshing on a very hot day. We went in 85 degree heat with a cloudy sky, and the water was perfect. Blizzard Beach Summit Plummet is one of the main attractions in the water park. A 120 feet tall water slide which reaches speeds of up to 60 miles per hour. I was not brave enough to try this ride, but I spent some time watching from the top of the mountain and the splash back that came from the riders was amazing. Other Blizzard Beach rides include Team boat Springs, the family raft ride which is the world’s longest family raft ride at 427 meters long. Each raft takes between four and six people so be prepared to split your family if you need to so everyone has someone to ride with. My top tips on this is when you step into the raft which is on a moving escalator, think about the weight difference of your family. Myself and Miss A stepped in first which meant we hit the slope first and we weren’t heavy enough to turn the circular raft around against Hubby and Miss A’s Granny, so we spent the entire ride going backwards down the slopes which Miss A didn’t like down some of the steeper slopes. 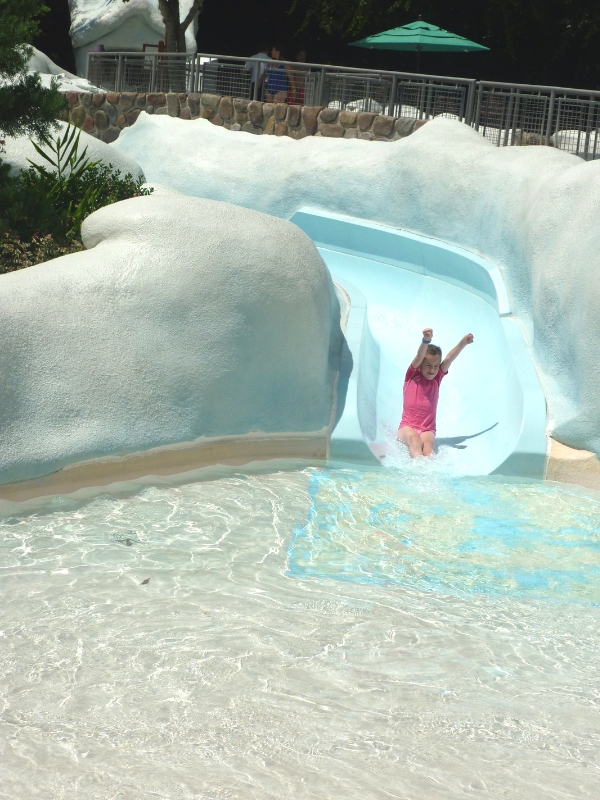 There is plenty to keep the family entertained for a whole day at Blizzard Beach. From the thrill seekers to the toddlers, there is something for everyone. Miss A particularly liked some of the smaller tube rides that she was able to ride alone, and then there were double tube rides that she was able to ride with an adult. We spotted a large shallow play area for smaller children but I found that as it wasn’t sheltered by any tall slopes it was open to the sun and got quite hot. There was also quite a lot of glare that came off the water which made it difficult to sit in the open areas and watch your children play in certain positions. The ground was also quite hot in this area so some footwear is a must. 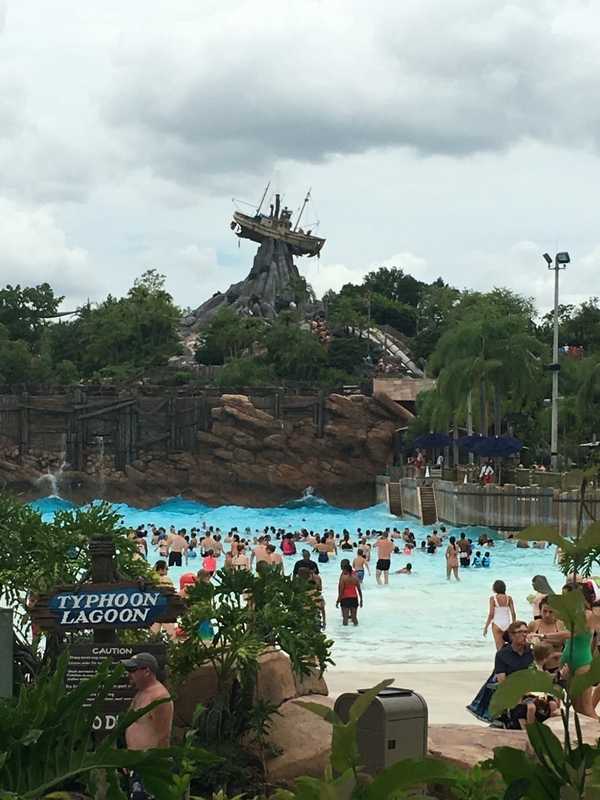 Disney World Typhoon Lagoon is based on the Legend on a huge typhoon that swept through a paradise and left behind all the wreckage that you can spot through the park. Typhoon Lagoon arrived at Disney in 1989 before Blizzard Beach, and stays open from January to October each year. As Blizzard Beach closes between January and March each year, you will always find one water park open if you travel off season. 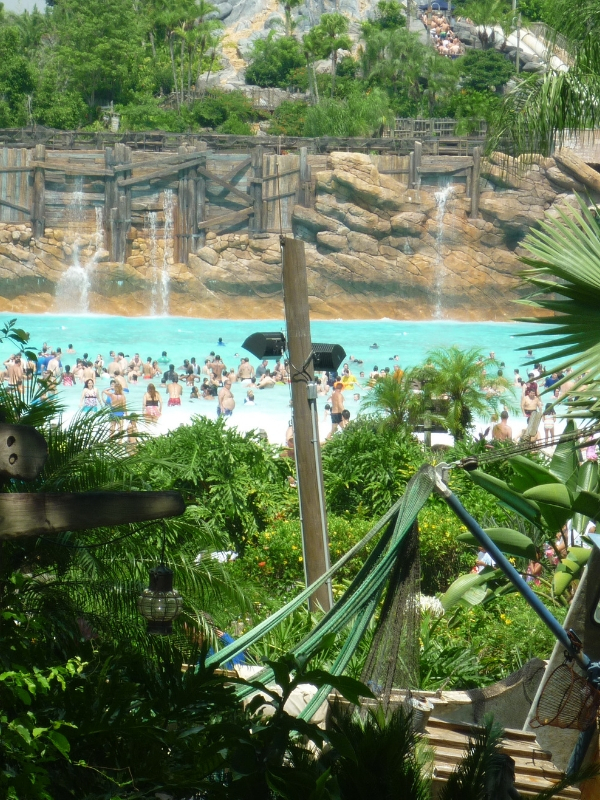 Attractions at Typhoon Lagoon include the six foot wave pool which is a big feature to the park. Every 90 seconds, six foot waves appear which are powerful if you are in shallow water, and gentler if you are in the deeper area. 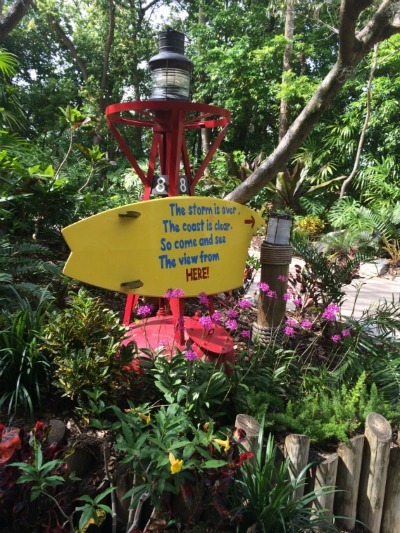 This was Hubby’s favourite place in Typhoon Lagoon and I think he would have stayed in it all day if he could. Like Blizzard Beach, the Typhoon Lagoon lazy river circles the whole park (Castaway Creek). This time we didn’t feel the layout was quite as well done as Blizzard Beach for seating near the entrances and we opted to leave our towels on a sandy area near some of the water slides. The entrances to Castaway Creek were dotted about a little more randomly and also the exits were on different sides depending on where in the park you were. This confused us a little as we could see where we wanted to get to but had to walk to a bridge to cross over. Other Typhoon Lagoon slides are on a similar scale to Blizzard Beach in the sense some are single riders, some on mats, others in tubes etc. There is also a toddler area at the front of the park which I thought was a little better laid out than it was at Blizzard Beach. A new raft ride was added for spring 2017, Miss Adventure Falls, which is the longest ride in the history of Disney Parks. I can’t wait to ride this during our 2017 trip. 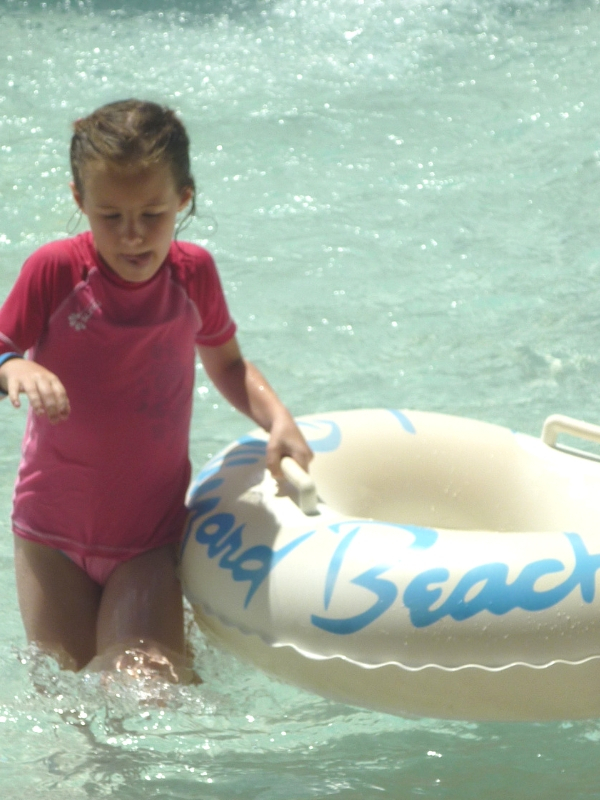 There is also a surface air snorkelling experience that children over five can participate in with adults if you wish. All the snorkels and equipment are provided. Both water parks have more than enough to provide a day’s entertainment with plenty of refreshment areas that are also part of the Disney Dining plan if you are on that option. Typhoon Lagoon is more of a leafy green area with sandy beaches, where as Blizzard Beach is a little more sparkly with less sandy areas. My family differ in their preferences for the water parks. I preferred Blizzard Beach and found the layout to be a little more organized, where as Hubby preferred Typhoon Lagoon because of the rides. If you visit in peak season when both the parks are open, I don’t see why you couldn’t visit both water parks in one day. Each park has plenty of lockers and shower facilities, so if you plan ahead and eat before you leave one park to visit the other, it could easily be done. My top tip for both parks is not to worry about the crowds and lack of seats as you walk into the park, walk through towards the middle and you’ll find plenty of quiet areas. The maximum wait time for a ride we saw in July was 20 minutes for Summit Plummet. We were in a long queue for the family raft rides but as they are continuous we didn’t wait very long at all, and most of the queue areas have little water jets that cool the floor down in the heat which was nice as you walked through them. 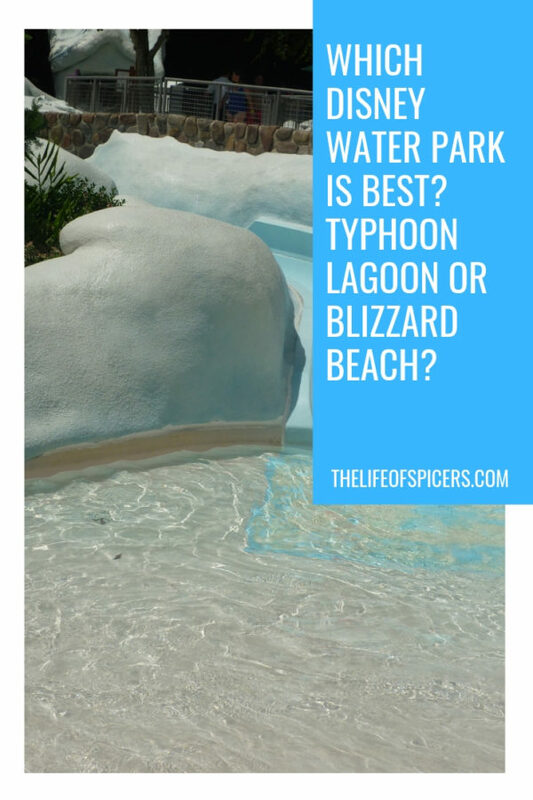 So which water park is is better at Disney World? 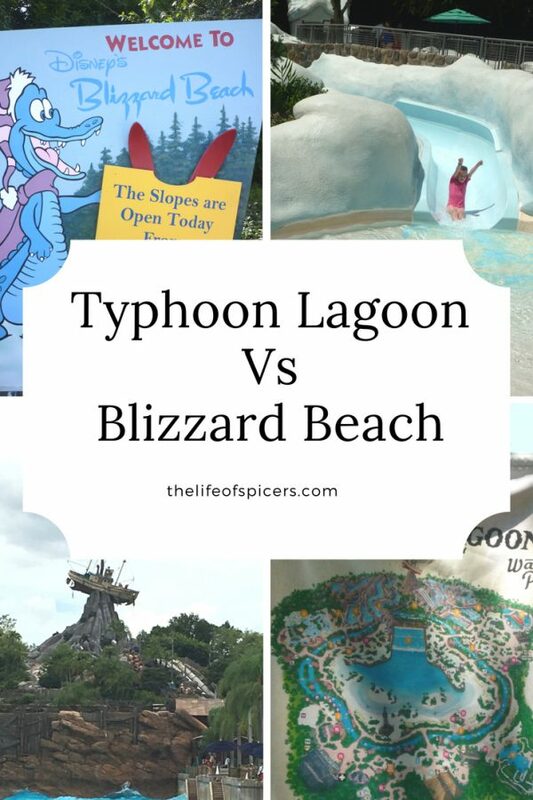 Typhoon Lagoon or Blizzard beach? Why not try them both and see what you think. Are Disney World Water Parks Worth It? Visiting Disney parks day after day is tiring, don’t mistake it. A water park is a great excuse to have some relaxation and take a rest from the hustle and bustle of the parks. 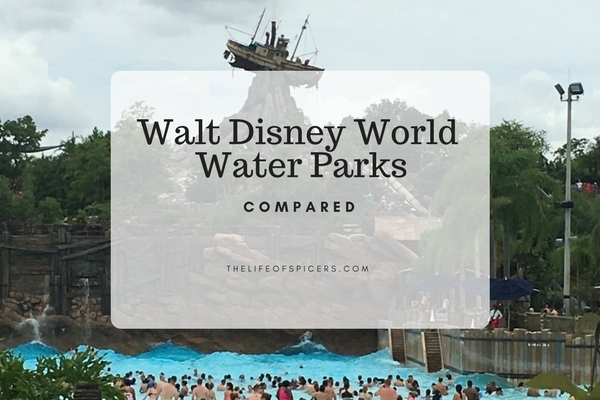 For us Disney World water parks are definitely worth it and we plan then into our itinerary every few days on holiday. We stayed at Caribbean Beach Resort during our first visit and thought it was so great we have now stayed three times. 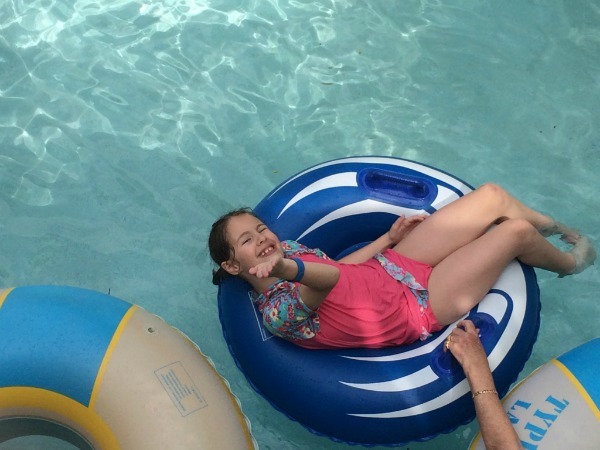 I learnt a lot from my first holiday to Disney World and am even more prepared for Advanced Dining bookings at 180 days, everything you need to know about Magic Bands and what to Fastpass for our next trip. I’m hoping we get time to visit both on our next trip.